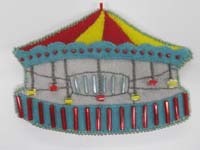 These embroidered textile works, also called reliquaries, are tiny versions of larger structures and objects. Each piece is a small pouch with a closure. All beads and stitches are sewn by hand, including the artists signature.